"Pardon me boy, is that the..........?" you know the rest! 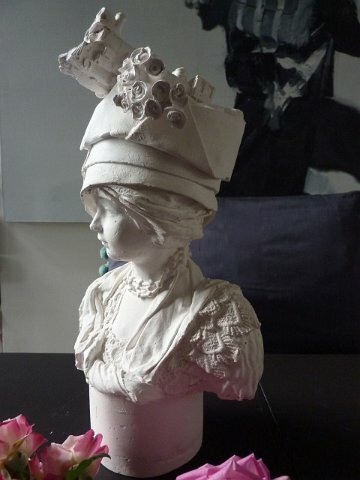 Introducing my latest plaster bust, Ms Chattanooga - complete with 'real' American steam train perched on her head. Ms Chattanooga was commissioned by cool on-line design store Roost Living and is available exclusively through them. It was brilliant that Laura of Roost Living had confidence that I'd create a new character that she would like. Luckily she did - and I hope her clients do too. This was the first time I poured the plaster into the silicone mould I'd made. Having taken the silicone-filled plaster from the jacket next stage is to pull the silicone away to find out if the mould worked OK - nightmare moment as many days work wasted if not. Her headdress turned out a lot bigger than I consciously intended partly because of the size but also the detail is very tricky to cast - not my initial intention, I just got carried away. I have a friend who's an ex-barrister and one day when she was clearing stuff out she gave me a big pile of her starched, winged collars - those are what I made the hat from. The train was extremely difficult to cast from as it's so detailed but it's such an iconic object I couldn't resist. 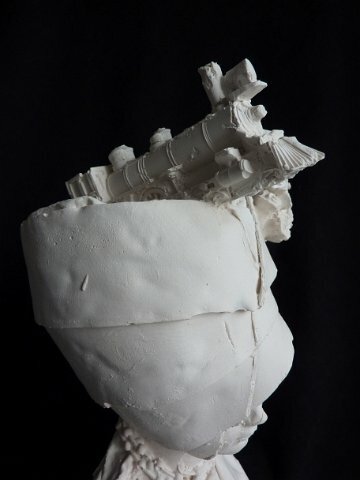 The plaster which leaks out of the mould edges is snapped off, purposefully leaving mould lines on the finished cast.I want the sculptures to be rough and ready and far away from a mass produced object. 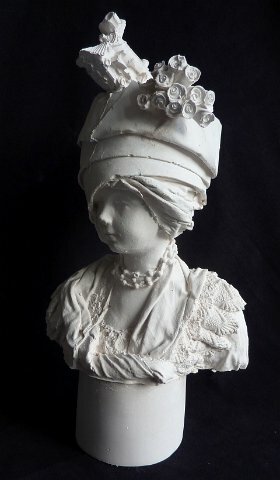 When I began the sculpture I'd just been to a show at the National Portrait Gallery of Thomas Lawrence, Regency portrait painter, and in the bust I made direct reference to the style of dresses worn by his aristocratic clients . I liked the juxtaposition of stylized roses and engineered object. Actually, I've been to Chattanooga in Tennessee, and guess what? I never got to see the train! 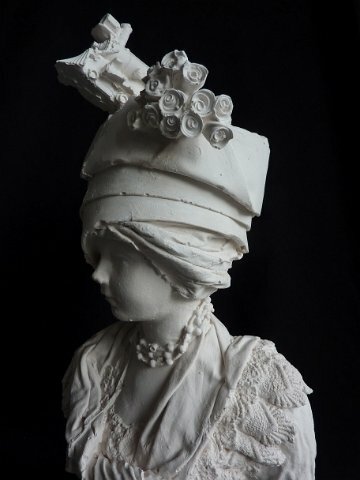 I really enjoyed creating Ms Chattanooga and was very flattered to be commissioned by Laura to make an exclusive sculpture for Roost Living. 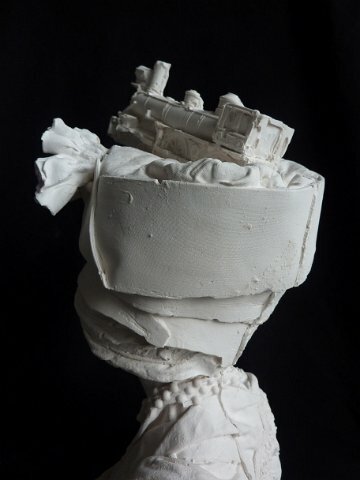 I'm looking forward to getting started on the next few busts I've got ideas for - as soon as I've finished the public sculpture commission I'm nearly coming to the end of. Frustrating not to be able to get my head stuck in to new work so roll on September! Ms Choo Choo must have had Buster Keatons The General on her mind ( http://www.youtube.com/watch?v=n3xh108cLbo ) and I wonder if the Guggenheim was designed from a wasp nest of old starched collars?? Congratulations Kathy I love this one, have fun in France and look forward to meeting up September time!! ooh we should take this one to an old train station somewhere for architectural context! !